A key committee in Armenia’s National Assembly on Monday did not give its approval to a bill co-authored by opposition lawmakers Zaruhi Postanjyan and Hrant Bagratyan that would commit Armenia to formally recognizing the independence of Nagorno Karabakh. The discussion of the bill that was referred to the National Assembly from the government on May 5 comes weeks after hostilities in the Armenian-Azerbaijani conflict zone during which President Serzh Sargsyan, the leader of the majority Republican Party of Armenia (RPA), warned Baku that Yerevan would consider recognizing Karabakh should the armed clashes escalate into a full-blown war. Azerbaijan responded by stating that the passage of such a bill in Armenia would mean an end to the internationally mediated negotiations on the status of Karabakh and would therefore entail a new war. Officials in Moscow also discouraged Yerevan from taking the step. 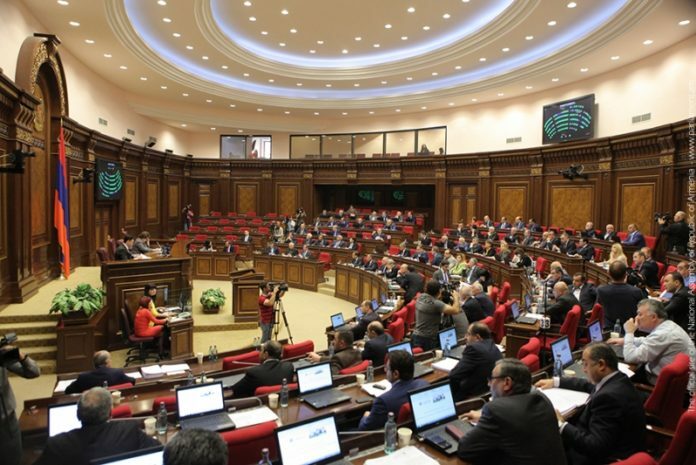 A majority of RPA members and representatives of other opposition factions in the Armenian parliament today call into question the prudence of passing a Karabakh recognition bill now, but they consider the potentiality of the move to be itself a major deterrence against a new Azerbaijani offensive. Postanjyan, Bagratyan and several other lawmakers, on the contrary, believe that only Karabakh’s formal recognition will provide more security guarantees against Baku’s designs to resolve the conflict militarily. After discussions at the National Assembly Foreign Relations Committee, most of the Committee members, both pro-government and opposition representatives, opted out of the ballots on whether to approve the bill and include it in the parliament agenda. In the first ballot only one member voted “for” endorsing the bill, and one voted “against” it. In the second ballot, with only “for” votes from Dashnaktsutyun and Heritage members, Committee Chairman Artak Zakharyan declared that the bill will not be put on the parliament’s agenda.